The kingdoms (basileis) of mythic Greece only partially coincide with their historical counterparts. What follows is an outline of the Greek kingdoms as they existed in the time of the Trojan War. 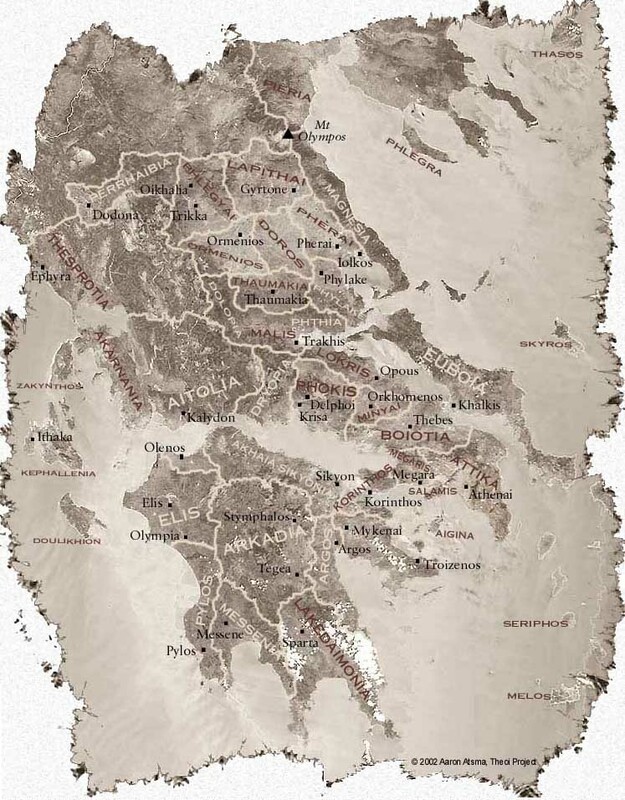 The map below is based on the Greek troop catalogue in book 2 of Homer's Iliad, using the towns and geographical landmarks listed to define the various territories. Some of it is guess-work or a rough estimation, especially in the case of the kingdoms of the broad Thessalian plain. N.B. For Odysseus' kingdom of Ithaca and Meges' kingdom of Dulichium (Doulikhion), I have not followed the Greek geographer Strabo's confused and uncertain identifications of the islands (which has been handed down to the present day). Ithaca, as it is described in the Iliad and the Odyssey, appears to be the western peninsular of the island of Cephallenia--and indeed there are ruins of an ancient Mycenean town beside the harbour. Dulichium is probably the southernmost island now named Zakynthos, and Homer's Zacynthus modern-day Leucas. The passages quoted below are from Lattimore's translation of the Iliad. Messenia sent no independent contingent to the Trojan War. The presumed heirs to the throne of Messenia were the twins Idas and Lynkeus who were slain by the Dioskouroi just prior to the War. The kingdom may have then been incorporated into that of King Nestor's neighbouring Pylos. The kingdom of Olenos was conquered by the Aitolians just prior to the Trojan War and so its troops participated as a part of the Aitolian contingent. Dryopia (the region later known as Ozolian Lokris) did not contribute any troops to the Trojan War. The kingdom was ruled by the Herakleidai (sons of Herakles) at the time of the War - see Thessalian Doros below (which was their main holding). Thesprotia did not send any troops to the Trojan War. It was ruled by Queen Kallidike at the time. At the time of the Trojan War the kingdom of Doros was ruled by the Herakleidai (sons of Herakles). They did not take part in the Trojan War since the Heraklid suitor of Helene, Tlepolemos, had been exiled to the island of Rhodes. Melos sent no troops to the Trojan War. Its king at the time was Polyanax. Delos sent no troops to the Trojan War. Its king at the time was Anios. Lemnos sent no troops to the Trojan War. Its king at the time was Euneus. Skyros sent no troops to the Trojan War. Its king was Lykomedes who had Akhilleus' son Neoptolemos in his care. The island was probably merely a vassal of Malis-Pthiotis. None of these island kingdoms participated in the Trojan War.